04-Feb-2015 Field Trip to Alberici Construction Headquarters — STILL one of the greenest buildings in the world. 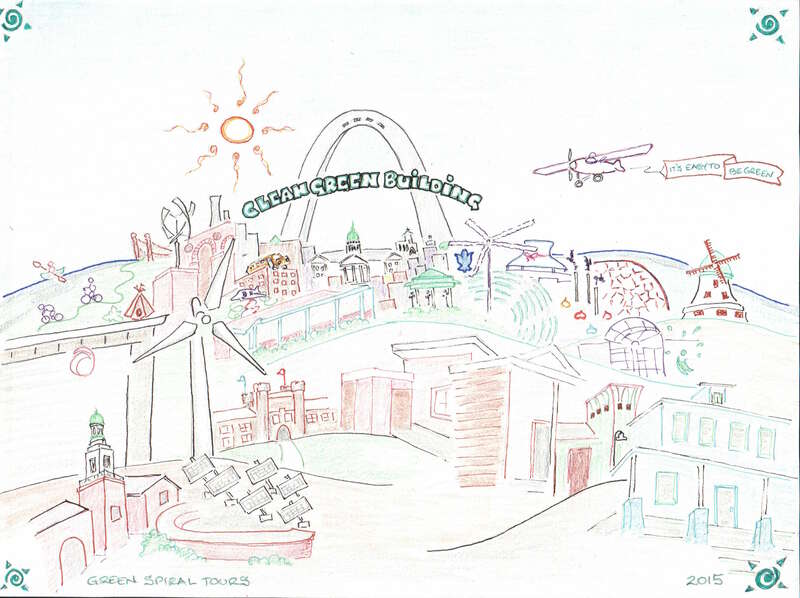 Each winter, Green Spiral tours a new green building in town. Many people are surprised to discover that Saint Louis is home to some of the greenest buildings in the world, and at the start of Year Five, it was time to spiral back to where we first started — with a tour of the Alberici building located just off I70. (Hint: it’s that building with the big windmill and the pretty pond near Page Avenue). It’s wonderful to check out new things in town, but important to know how well green buildings will stand the test of time; the Alberici Building was designed to stand for a very long time, and it’s more beautiful today that it was five years ago. That’s progress! Along with the Platinum Alberici Building, we have the first Passive House in Missouri, located in Dog Town, the first Active House in the USA, located in Webster Groves, the highest number of private LEED platinum residences in the country, and thanks to Wash U, Saint Louis hosts a “Living Building” — quite possibly the greenest building in the world when it was built only a few years ago. Plus, we have two Platinum LEED schools and our Gateway Chapter of the U.S. Green Building Council is particularly robust. That’s a lot of strength in green building! But great designers can only make great buildings if they have great clients and willing team-players; and that’s a job for the the rest of us who are interested in all things green and all things education. If you believe in experience as first teacher, and if you missed the field trip and want to catch up, it’s easy to do! Here’s a blog post about the most important green buildings in the area, along with details about how to tour them on your own or in a small group. If the link doesn’t work, look for the Green Building Tours blog post in the lower right hand corner of the web-page. Do your homework first; then organize an experience in real time with a small group of others who will ask questions you never thought to ask, thus super-charging your learning. Afterwards, take time to integrate the experience into your view of the world through words or pictures you share with others. And that’s how your own fun field trip can help make the world a better place! How do we organize for a tour? And how much would it cost? There is one tour guide, scheduled by request. I will amend the blog-post and include the phone number! I am so disappointed I miss this tour of the Alberici headquarters! What a cool building! Do you know that happened to their wind turbine? And what the plans are to repair it?